As you may know, the new TMBG album, Join Us has been out for over a week. If you have not purchased it yet, what are you wating for?? Tonight is the record release party at the historic Stone Pony in Asbury Park, NJ. 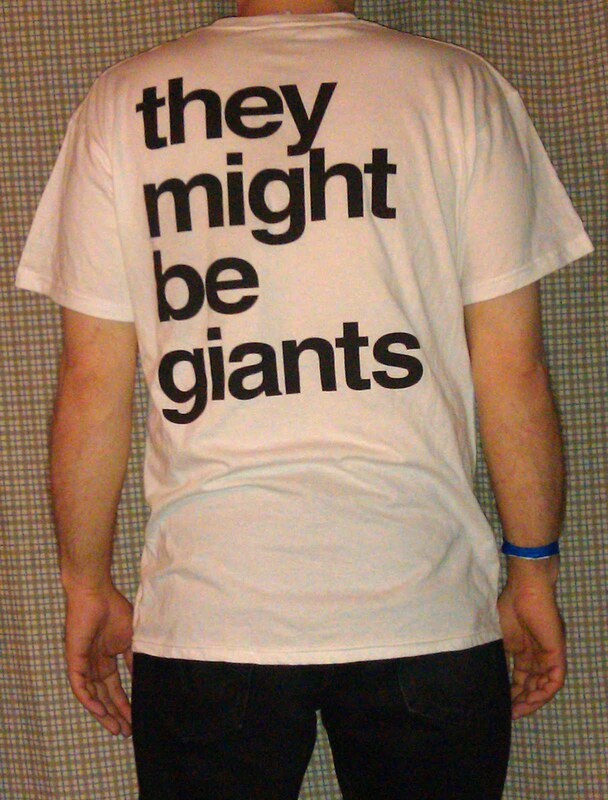 It will be my 180th TMBG show. See you there! Here's the official album cover shirt by graphic designer Paul Sahre, with the side and rear of the hot pink monster hearse on the front and back of the shirt, respectively. You can buy this shirt at the Merch Store, along with the Join Us digital download, CD, Vinyl record and even an oversized poster of the cover design. I got 'em all! I also purchased this alternate version at the merch stand yesterday at the Williamsburg Waterfront. 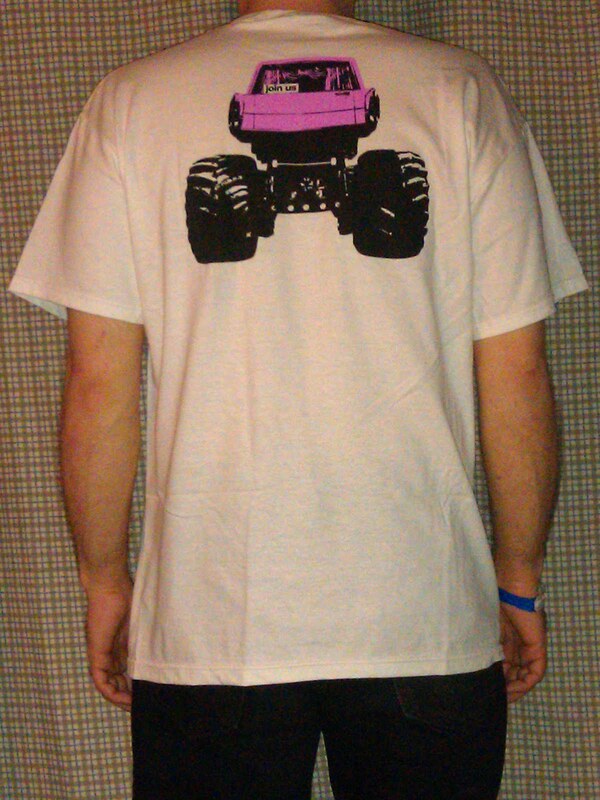 It has an enlarged truck on the front and the band name in large lowercase letters on the back. I'm pretty sure that the Johns were not actually running for anything, back in 2004 when the shirt was introduced. Featured is a coat of arms-type presentation of the guitar and accordion. Also included are their logo, slogan and operational-at-the-time DAS phone number. The whole deal is resting on attractive golden laurels. It's really all quite majestic. 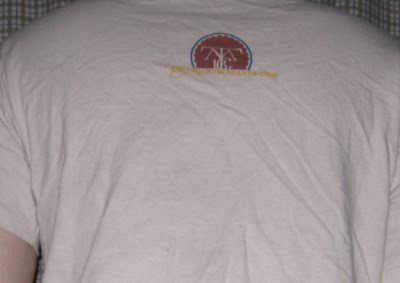 The back is sparsely decorated, with just the logo repeated and overlapped by their website address. Support the ultimate fantasy regime. 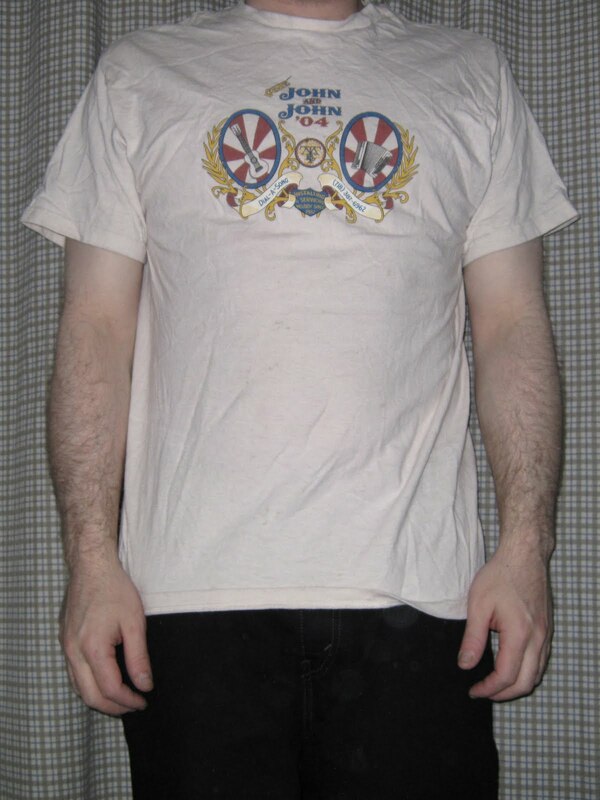 Purchase "Vote Johns on Cream" from the merch store now! 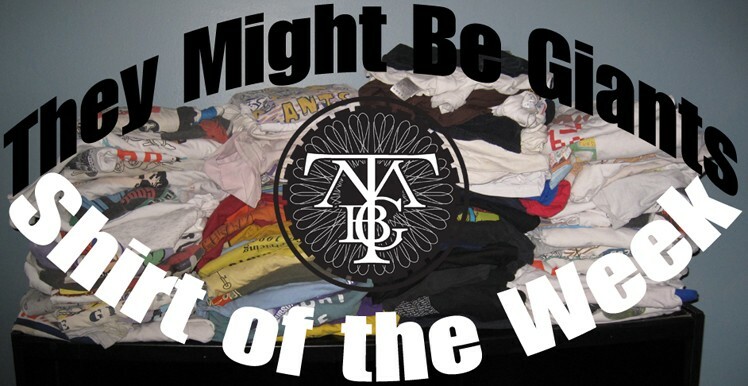 I have now presented to you roughly half of my TMBG T-Shirt Collection. 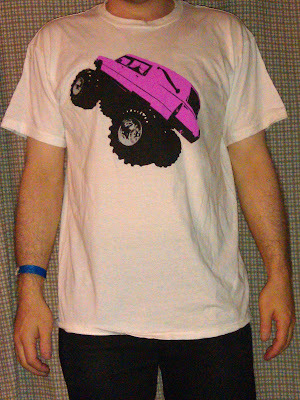 At present, completion of this project is projected for March, 2012 or possibly later, depending on how many more shirts I have scored by then. Three more are currently on order, including the new Join Us album cover shirt. Speaking of which, Join Us is available right now. So what are you waiting for? Go get it! Performed at the Bowery Ballroom in New York City on 4/20/00. 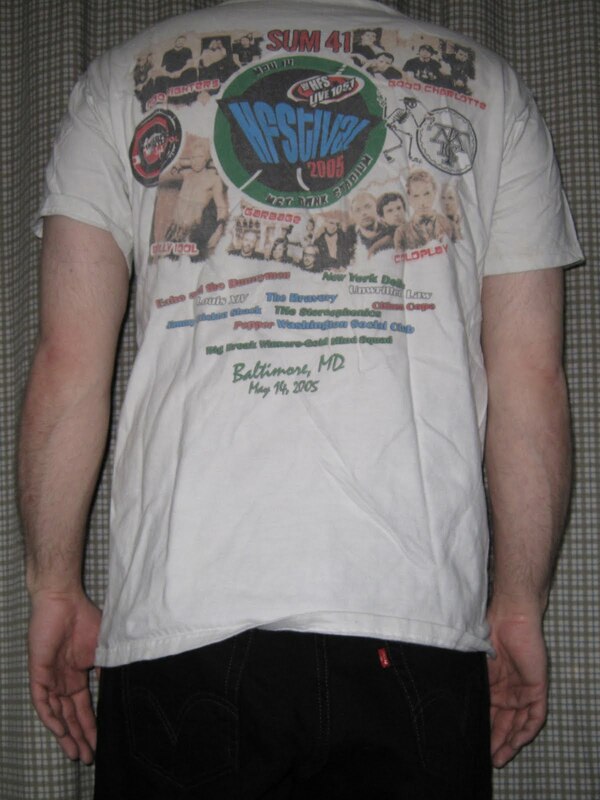 Here's a shirt that features three US postage stamps surrounding the band name in the Miscellaneous T font. Giant reproductions of these stamps were used as a backdrop during the Flood tour. Listen for John Linnell singing a Sesame Street-invented word, "abcdefghijklmnopqrstuvwxyz" at the Bowery Ballroom in New York City on 4/20/00. 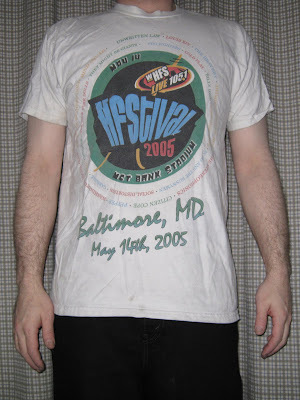 Back in 2005, I attended a huge stadium show in Baltimore, MD. Included in the lineup were two of my favorite bands: TMBG and Garbage. 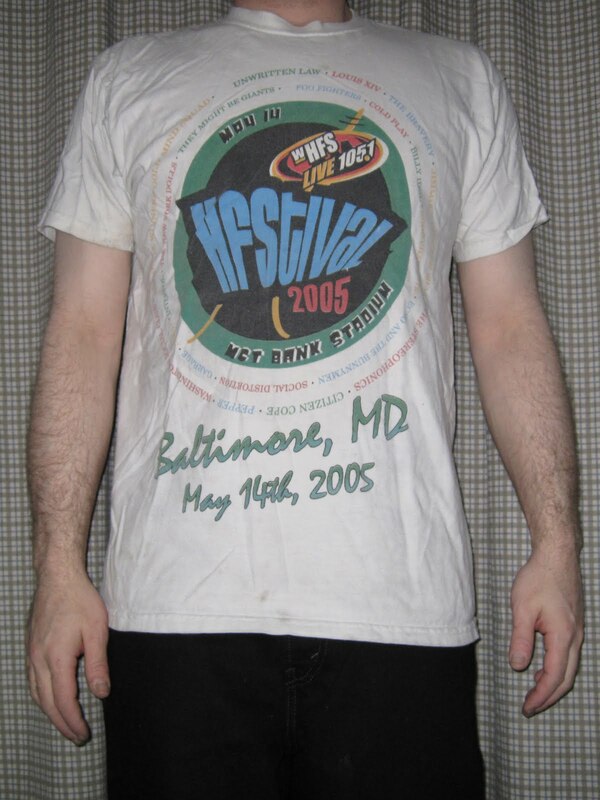 Other acts appearing included Interpol, Echo & the Bunnymen, New York Dolls, Social Distortion, Good Charlotte, Billy Idol, Coldplay and Foo Fighters. 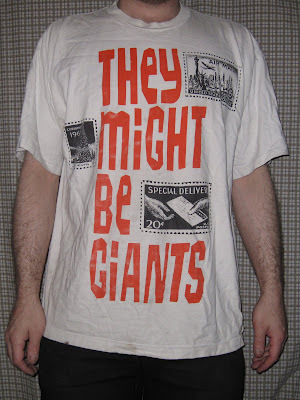 As you might suppose, TMBG didn't get the best reaction from a crowd made up of mostly fans of the big-name acts. 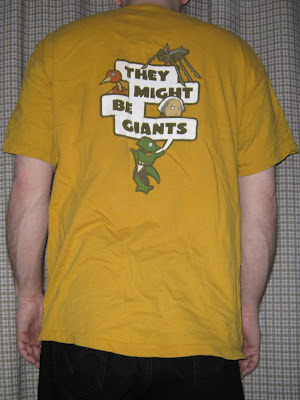 I think that I saw one other TMBG shirt. 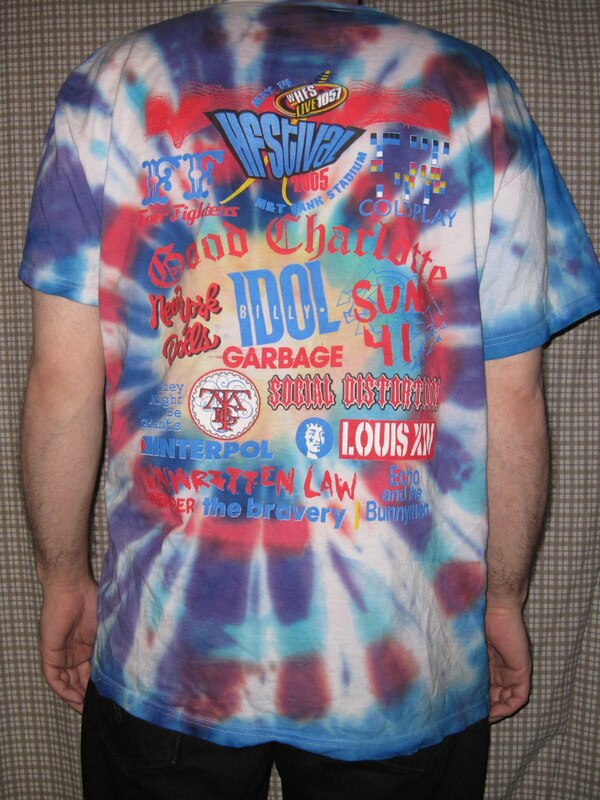 I found this stunning shirt on eBay last year. It's much prettier than the boring version that I bought at the show. 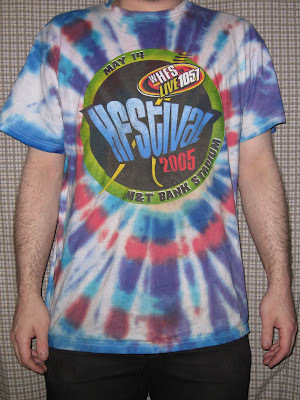 It's kind of a tie-dye pattern, though not nearly as random as other hippi shirts that I've seen. The back is a collage of band names and logos, including the They Might Be Giants logo near the bottom left. I shot a little bit of video at this show, just to capture the size of the crowd and TMBG on the awesome Jumbotrons. This clip of Particle Man has become the most viewed TMBG video that I have on YouTube. People love Jumbotrons! 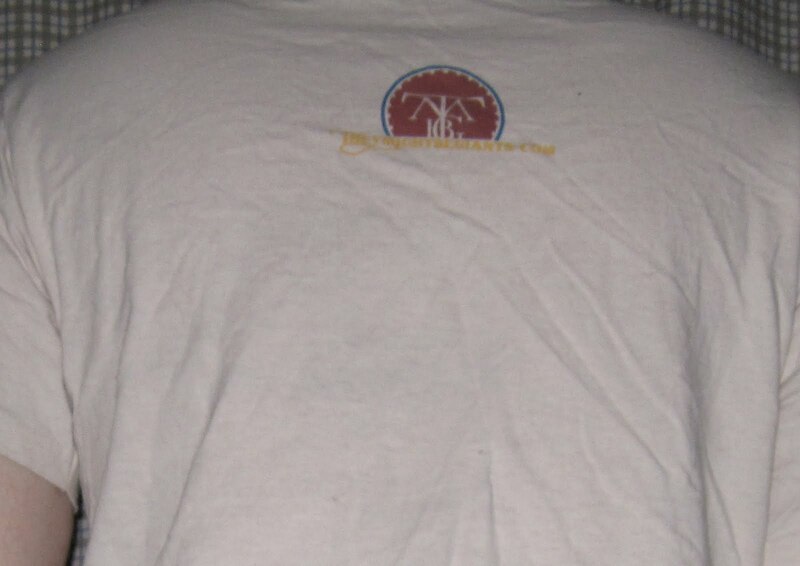 Here's that boring shirt that I was talking about, which I purchased after the show. The back is a little different, with photos of some of the bands. Just the TMBG logo again, this time in the middle on the right. 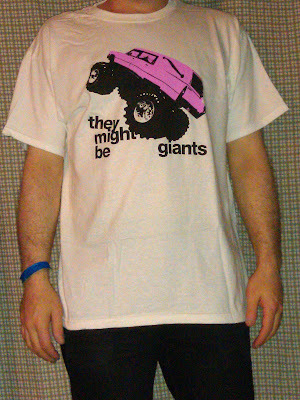 Ladies and people, here is my offering for TMBG’s Can’t Keep Johnny Down Video Contest. No cats, as per request. It’s a time lapse of my annual trip to the tattoo parlor. This year, it’s the cartoony Johns from Here Comes Science as They appear on the album's official sticker sheet. Chooch at Bayside Ink Tattoo in Beachwood, NJ did the honors on July 6, 2011. You don't see it in the video, but I wore the pretty HFStival shirt while being jabbed repeatedly. Actual time under the needle: 25 minutes. No blood, I promise. 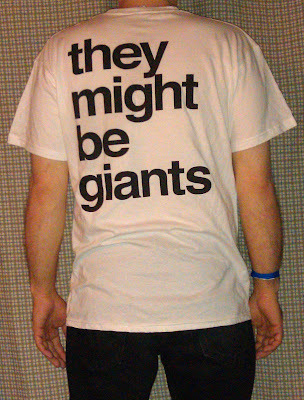 I don't really think that this is Grand Prize material, but if I'm very, very lucky I might win myself a TMBG pizza! 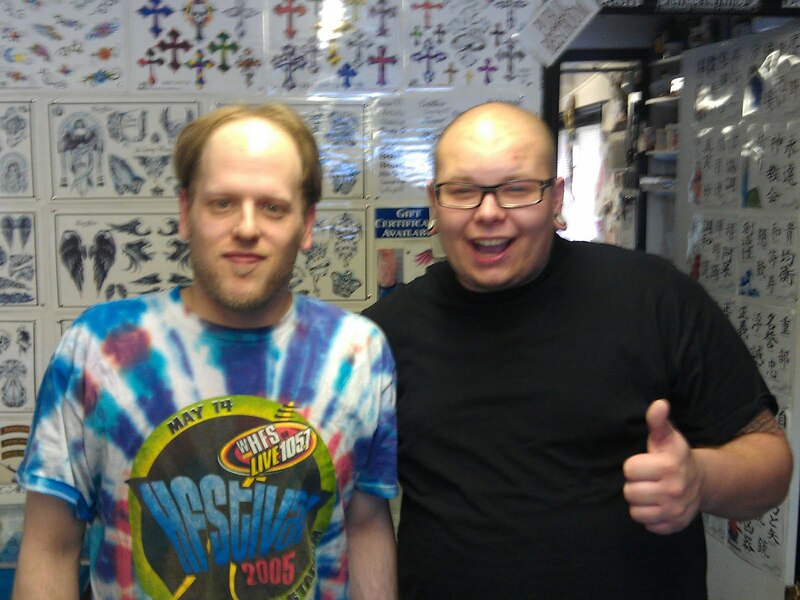 Here's me and Chooch after it's all over. Great Job! Performed with an eight-piece horn section at the Bowery Ballroom in New York City on 5/4/00. Yes! It's No!.. TMBG's first foray into children's music back in 2002 produced this shirt, creating the illusion of perpetual negativity on behalf of the wearer. A child bearing a giant "No!" word balloon seems particularly congruous, given their propensity for just such an exclamation. Similar to, yet different from the album cover, it features the same Chopping Block characters.. which I always thought are kind of creepy looking if you ask me. 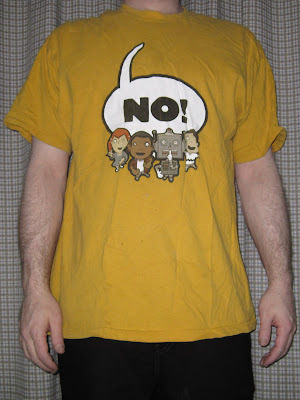 The back reveals the source of this childish negativity, featuring more characters from the Chopping Block animated videos on the enhanced CD, including four fifths of George Washington's head. This shirt is available in both adults' and kids' sizes on the TMBG Merch Store, as well as a special version in pink (not only but) especially for the ladies. 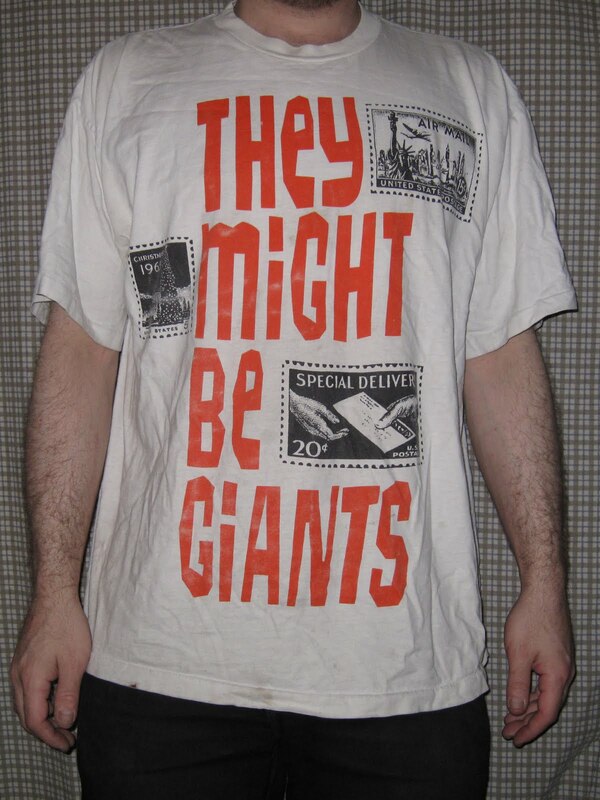 Performed at my very first TMBG show, on 4/28/93 at the Count Basie Theater in Red Bank, NJ.